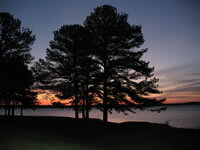 See the West Point Lake website for additional information. Primary recreational opportunities are listed below. Directions: From Atlanta, take I-85 S to Exit 14 into LaGrange. From LaGrange take US 29 South 16 miles, the visitor center is on the right. From Auburn/Opelika take I-85 N to Georgia exit 2. Go left then go right on US 29N. The visitor center is on the left. Factoid: Fishing is probably the most popular activity on West Point Lake. A dozen creeks and more than 40 square miles of lake provide plenty of good fishing spots for the thousands of anglers who fish here regularly. The lake abounds with bass, catfish, crappie and bream. Bank fishing is excellent at many locations, including public fishing piers at Hardley Creek Park, Rocky Point Park, and McGee Bridge Park. All of the piers provide access for persons with disabilities. Preteens and visitors with disabilities can also fish in a pond at Hardley Creek Park.